QT Level 2 (QT2) helps us journey beyond the boundaries of who and what we thought we were in ways that we can change, with new skills, new professional tools, new applications and much more. 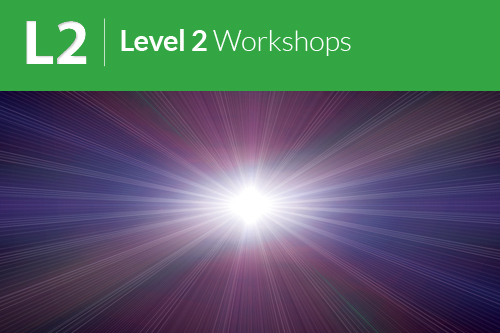 QT2 is a dynamic and enjoyable workshop full of amazing discovery, power, love and ease of transformation. This workshop gives Massage Therapists 13 CE hours and Hypnotherapists 12 CE hours. Registration is $700 for those paying BY March 22, 2019 OR $785 for those paying less than 21 days before the workshop, OR for those repeating the live workshop and/or for children 18 and younger, the class fee is $392.50. A registered adult must always attend the workshop with anyone younger than 19. I prefer check or cash but will accept debit cards, credit cards and Venmo. Quantum-Touch sets the fee schedule. I look forward to meeting and working with you soon. Get ready to be astounded at what YOU are able to do! Contact Lorrain to register for the workshop @ thehealersgarden@gmail.com or 480-695-3341. You MUST have taken a Level 1 workshop before taking Level 2. You will need the name and date of the Level 1 instructor you took the workshop from. "Your workshop has made me believe in me." "Very educational class. I'm glad I found such a tremendous instructor." "Lorrain brings a personal touch, humor, kindness and experience in other areas as well. I would recommend taking the class from Lorrain." "Lorrain provides me information and exercises that make the class very real. The practice sessions and reminders to "breath and sweep" will help me remember this going forward." "The Quantum Touch class is designed to help us work on both ourselves and others which is a huge benefit. It is an investment in not only our education but in ourselves." "The Quantum-Touch workshop was a great experience. I learned many new things and am very excited to start using them in my practice. I had no idea the things the body is capable of. I look forward to more classes."